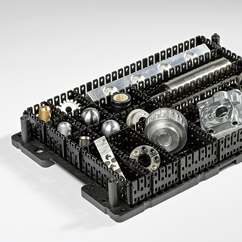 techtray is a modular workpiece carrier system that ensures greater security and efficiency in industrial parts cleaning and in-house production logistics. For optimum cleaning results in highly sensitive areas, techtray combines the advantages of plastic workpiece carriers with the design of a metal mesh rack base. Prevention against damage and optimum rinsing during the cleaning process make techtray the new standard in industrial parts cleaning, parts handling and parts logistics.